Emma Mildenberger - Emmaz Live! 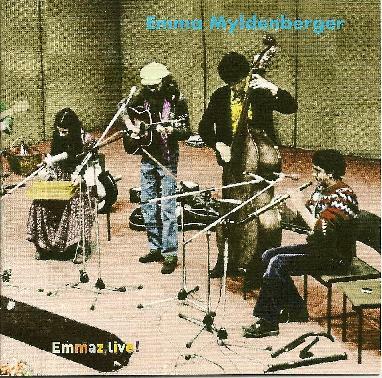 Formed in Germany in 1976-77 Emma Mildenberger were six musicians from the Weinheim an der Bergstrabe area, situated between the Rhine and the Odenwald. They played a meld of jazzy folk music in the style of Robin Williamson & his Merry Band, as well as a more traditional, almost gypsy sounding music, and they were also known for their rustic medieval influences. Here, thanks to the Garden of Delights label, we can now listen to this fantastic band live for the first time on CD. They sound as good here live as they do in the studio, and I find that the power of this performance shows exactly what a talented bunch of musicians they really are. Much the same as the studio albums we can hear all the Crum Horning that we would want to hear, and again we are thrown back into the pagan times, where the dark ruins hide mysteries, and the mysteries were sometimes worth dying for. It is pure film soundtrack stuff and it sets the scene for a gallant search for the Minator, or a quest over the oceans with Sinbad the Sailor. The ambience that these six musicians create is total festival music. It is earthy and passionate, and the almost Arabic nature of some of tracks sounds very authentic for non-Arabs, although there is a western style of classical music always lurking in amongst it all, this makes the whole thing a sound pool for the folk enthusiast, and should be investigated further by those who are curious to the world of the Crum Horn. Early Corvus Corax were surely influenced by these people?